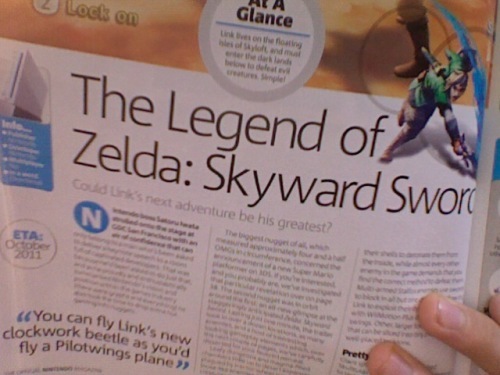 Recently I’ve preferred to stay as far away from release date rumors as possible, but this juicy one from Official Nintendo Magazine seems plausible enough, and since ONM is one of the publications that’s closer to Nintendo and this info appears to come out of a meeting with Iwata, I think it’s probably pretty likely. As you can see in the image above, they’re guessing at an October release. Personally I was hoping for it to hit a little earlier so I could donate part of my summer to it, but I can see the wisdom in a mid-Autumn release. Jump inside for some thoughts. It may not be the most convenient time of year to be thinking about video games – in fact, if this projection is accurate, the game will more than likely hit smack in the middle of my midterms – but from a business standpoint it makes a lot of sense. Consider this: a game’s sales during any given period have one true ceiling – the number of copies shipped. While it’s always a good sign when a game sells out everywhere – that means you have a product whose demand exceeded expectations – you can obviously achieve better sales if there is more supply. Since October is not exactly prime time for sales, it’s actually pretty unlikely that the first wave of demand, even for a grade-A Zelda title, will totally outpace even a moderate level of supply. This will give them time to build up a good stock to ship the next month, when the holiday shopping season starts. Otherwise the core crowd would have to compete with the seasonal shoppers – we’ve seen this before when games like New Super Mario Bros. Wii were selling out all over the place. Of course, even taking the supply vs. demand factor out of the equation, it’d still be good to give the game a month of breathing room to settle in to the “must have” crowd before the shopper moms start flooding the stores after Black Friday to better gauge interest among the core crowd – otherwise the game’s success among its key audience might get lost in translation amidst the craziness of the holidays, where the big games almost always sell pretty well. Should Skyward Sword prove to be a success, Nintendo will be able to know for sure that it reached its main target audience – its core customers, the ones who actually follow gaming news and have been interested in the game since long before its reveal – and that it probably wasn’t just a game that everybody went out and bought because it was the big Wii game this year. Both cases mean a good flow of revenue for Nintendo, but only one tells them whether the game was successful in the areas that really count and gives them the green light to continue in that general gameplay direction.